Sunrisers Hyderabad, SUN TV Network, owned cricket franchise team of Indian Premier League (IPL) representing the city Hyderabad at IPL. Sunrisers Hyderabad are the Champions of IPL 2016 and their first match in Indian Premier League (IPL) 2017 is against the Royal Challengers, Bangalore, the runner-up of the Indian Premier League 2016 on the opening day of IPL 2017, 5th April, 2017 at Rajiv Gandhi International Cricket Stadium, Hyderabad, Telangna. 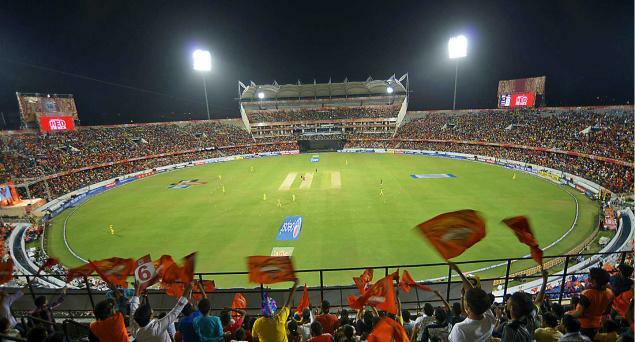 Home Ground: Rajiv Gandhi International Cricket Stadium, Hyderabad, Telangna.